Homagama Magistrate’s Court today postponed the hearing of the appeal made by Bodu Bala Sena (BBS) General Secretary Ven. Galagodaaththe Gnanasara Thera till 2 p.m June 22. The Magistrate postponed the hearing of the Thera’s appeal due to the absence of the Officials from the Attorney General’s Department. On Monday Galagodatte Gnanasara Thera filed a Fundamental Rights petition at the Supreme Court, seeking to declare that the order given by the Homagama Magistrate to keep him in remand custody in 2016 is unlawful and is violating his Fundamental Rights guaranteed in the constitution. 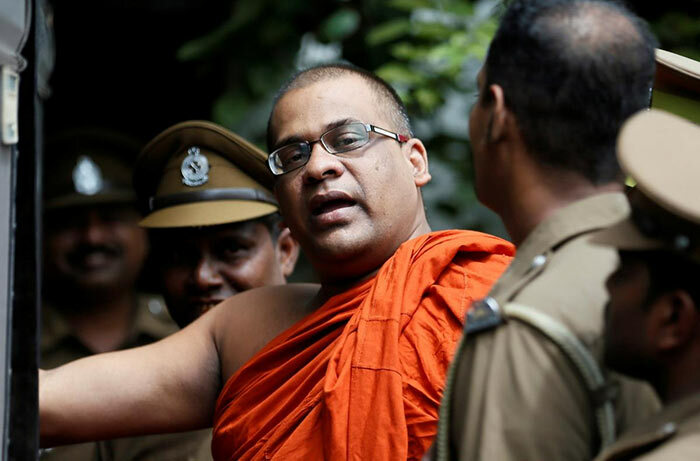 Gnanasara Thera was sentenced to one-year rigorous imprisonment which ends in 6 months after he was found guilty of making death threats against Sandhya Eknaligoda, the wife of missing journalist Prageeth Eknaligoda, on June 14. He was also fined Rs. 3,000 by courts and was ordered to pay Rs. 50,000 as compensation to Sandhya Eknaligoda. This hearing was postponed due to ‘the absence of the Officials from the Attorney General’s Department’. Have the officials been ‘white-vanned’?